2 buttons to set timer and start/pause/reset. This time without additional code quotation, please find some code explanation within code, so code bellow. This entry was posted in Arduino and tagged 16 bit timer, 7 segments, buzzer, countdown, LED, timer on August 24, 2010 by Darius. 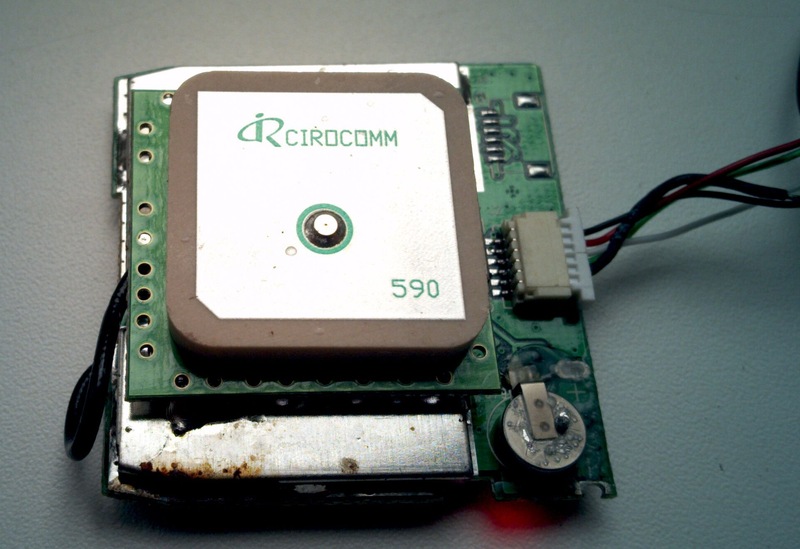 I have idea to build precise clock, and GPS module is here because GPS satellites has atomic clock on board. I have chosen particularly this module, because it was the cheapest, that I could find on internet, only 15 USD with free shipping. 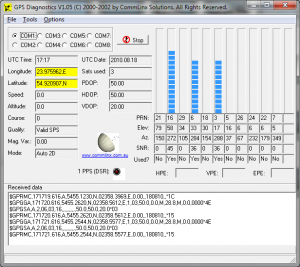 While new GPS module costs 60 USD, thought You could find completed GPS navigator for 70 USD. Module has simple 5 wires connection. It’s powered from 5V, but can also work form 3.3V power supply. Data from/to device flows via well known RS-232 interface’s RX and TX data lines. Module can be directly connected to PC using RS-232 (com port), but is also needs 5V power source, USB works well. RS232 have the same data structure as UART, but voltage levels are different, so it can’t be connected directly to microcontroller, logic level converter MAX232 must be used. Module use standard NMEA-0183 standard interface for data transmission. One reason it’s good, because module outputs data continuously without any request, so really it can be used only one RS232 data line. To test bought GPS module I had connected it to my desktop PC RS232 port. It’s very easy to test. 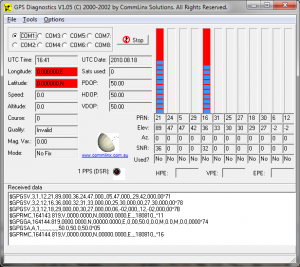 because seller send my with documentation and test software – GPS Diagnostics V1.05. 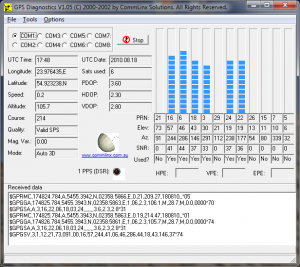 It decrypts data in NMEA format and shows it in user friendly way. 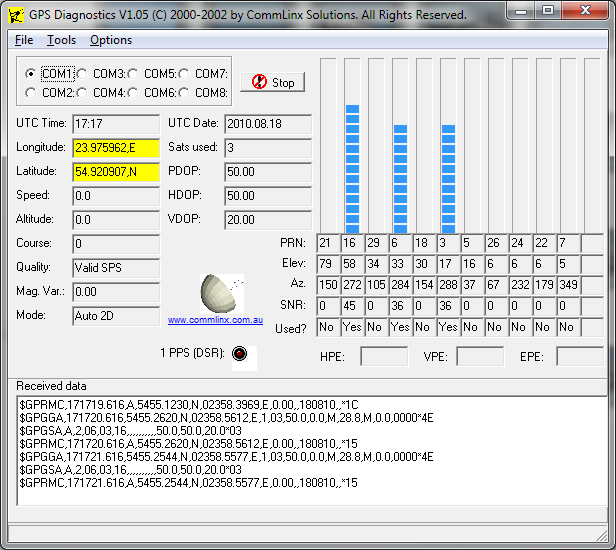 After 7 minutes I got data from 2 satellites, no location info still, but UTC date and time from satellite. After 18 minutes location is found. Here is module’s best result – 6 satellites, but still near open window. Module saves date, time and location information in memory. Next time it is turned on it uses that information for faster GPS fix. With built in RTC (Real time clock) used time is current, not the same as was when module last time worked. This entry was posted in Uncategorized and tagged Ebay, GPS, GPS module, NMEA, RS232, Sirf II on August 19, 2010 by Darius. How counter works? It is simple independent 16 bit accumulator, which value increases by 1 at clock cycle. 16 bit means that maximum counter’s value is 65536. When this value is reached counter starts counting from 0 again and gives hardware interrupt. Counter value could be changed any time. This is normal counter mode, Atmega 1280 offers total 14 operating modes. This entry was posted in Arduino and tagged 16 bit timer, Arduino, clock, interrupt on August 3, 2010 by Darius.